The New Mexico Compilation Commission has made available every published New Mexico case on its website. 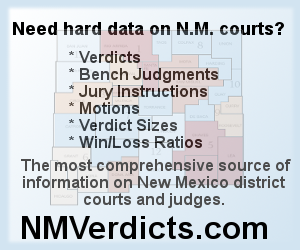 The cases have vendor neutral citations and paragraph numbers, and are the best reference for New Mexico case law. Unfortunately, navigating the cite to find these opinions is a bit cumbersome. CiteKeeper makes it easier to find these cases, as well as to find vendor neutral citations in order to comply with the N.M. Supreme Court's citation rule. Simply enter a citation to a New Mexico case below, and we will provide a complete citation and link to the compcomm cite for access to the official opinion. CiteKeeper users can get the same information and more by searching for a N.M. case by citation. Note: although we have a complete list of vendor neutral and N.M. reporter cites, we do not have complete information for the pacific reporters and may not be able to find citations such as 123 P.2d 456. For best results, use the N.M. reporter or vendor neutral cites. Richter v. Van Amberg, 97 F. Supp. 2d 1255 (D.N.M. 2000).